Out of this World! Incredible! Beyond expectation. Wowed at every turn. 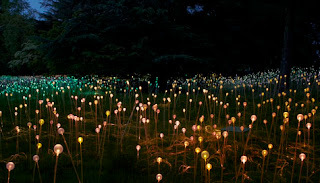 How do I begin to describe the amazing light exhibit by UK light artist Bruce Munro at Longwood Gardens? 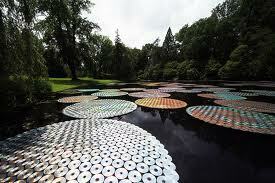 I was privileged to attend the preview of the Bruce’s first garden installation in the US this past Thursday. 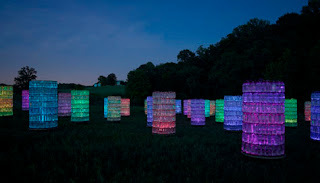 The exhibit features two huge installations in the conservatory and an up-close collection of small illuminated sculptures in the ballroom, but it is the seven amazing large-scale outdoor installations that will take your breath away . As we left the preview reception and wondered down the main garden walk, we strolled over toward the fish pond and were greeted by the first installation called Arrow Spring which mixes purple sage and other plants with bees wax candles to create a meandering hillside stream. A walk in Longwood’s Meadow is a highlight with 69 symmetric towers made from recycled water bottle that create a glowing maze of light that changes hues to music. It’s fun to just glide through the light and sound as twilight turned to night. 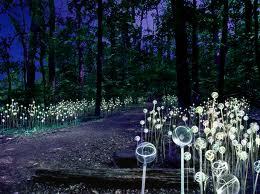 But the real mind blower was the Forest of Light. Looking out from one of the Longwood tree houses over the sea of some 20,000 stems of light undulating in changing colors of blue, pink, purple and white made me feel like I was in another world, a fairey princess looking out over a magical kingdom. 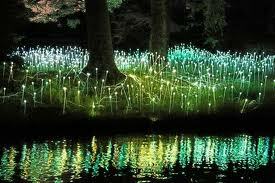 It was enchanting and literally took my breath away. Inside the Conservatory, six nine foot Snowball Chandeliers formed by 127 perfectly uniform glass balls that change color. A massive Light Shower rains more than 1,600 drops of twinkling lights over the flooded Fern Floor, and a small collection of Munro’s illuminated sculptures and models are on display in the Music Room. Longwood is encouraging guests to interact and is making iPods available and even has an app you can download. The show runs through September 29. It’s definitely a must see event and well worth a special trip. Timed Tickets are required for Gardens Admission and can be purchased online at http://www.longwoodgardens.org/.